Many armor enthusiasts and historians know of the tank factory at Lima, Ohio, but did you know that Cleveland had its own tank factory? During World War II, both were under control of General Motors. During the war, Lima indeed worked on tanks, but Cleveland had been set up to support the B-29 Superfortress program. While much of the factory floor was dedicated to the construction of subassemblies for the B-29, Cleveland was also tasked with the construction and testing of a new fighter, the P-75 Eagle. The USAAF later cancelled the Eagle program after five production aircraft were delivered. If you're not really familiar with the P-75, the author has complied a nice selection of photos of the aircraft under construction and in flight. Because of Cleveland's experience with the P-75's Allison V-3420 engine, did you know that they adapted the engine to the Douglas XB-19 prototype as well as to a Boeing B-29? The title has nice coverage of those details as well. Of course, what good is a tank plant if it isn't producing tanks? 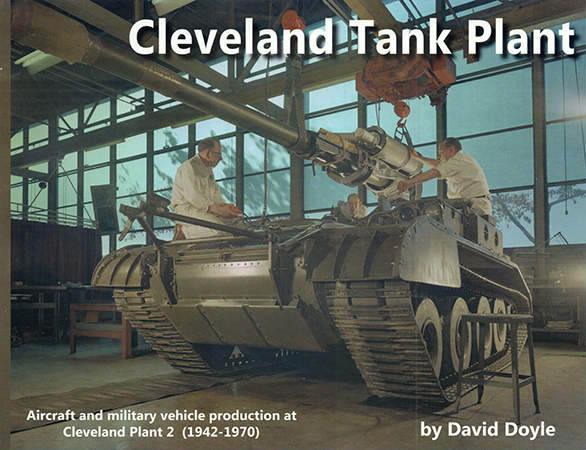 This title covers the post-war transition of Cleveland Plant 2 to armored vehicle engineering, development, and construction. The first vehicle developed at this facility after the war was the M41 Walker Bulldog and in parallel, the M42 Duster. Other vehicles followed including the M114 CRV, M109 SP howitzer, M551 Sheridan, and MBT-70. If you're looking for good details of these vehicles under development and testing, this is the title that you want. This title is well-illustrated and features some in-depth captions to walk you through the history and details with imagery. Whether you're a military history buff, aviation and/or armor enthusiast, or scale modeler, you'll find great photos and information in this great title that provides a great historical perspective to Cleveland's contribution to national defense.